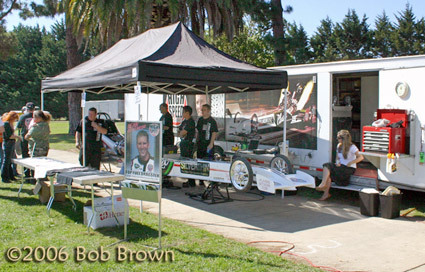 October 21, 2006: The High Speed Motorsports/SilverThin Bearings Nostalgia Top Fuel Team was the featured event at a fund raising car show that took place in Lompoc, California on Saturday, Oct. 21, 2006. 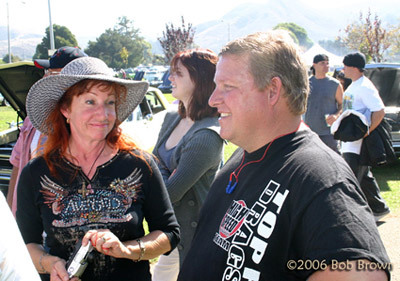 The park was filled with 125 classic cars, hot rods and motorcycles, a top fuel dragster, an alcohol dragster, and nostalgia funny cars - all in support of local resident, mechanic, car and bike enthusiast Josh Heilbron who is stricken with several forms of cancer and faces an uphill battle to recover. The medical bills are mounting so several local car-enthusiast friends decided to organize a Benefit Car Show to help him out. Some appeals were made and the HSMS boys answered the call in a big way. Also his friends, and most of the business community came out to give support and raise money to help him in his battle. 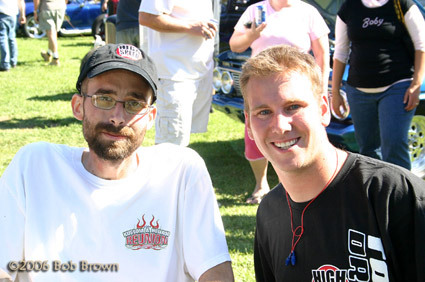 The show sold over 1800 raffle tickets, 480 chicken dinners, and raised over $11,700 on Joshs behalf. 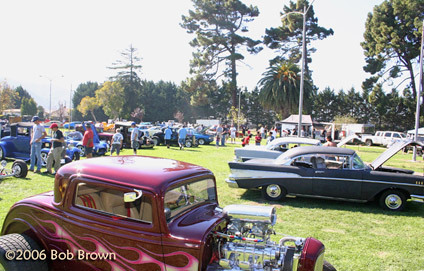 this got everyone who attended the festivities at Ryan Park in Lompoc pretty excited. Here are a few scenes from this day of fun and good will. 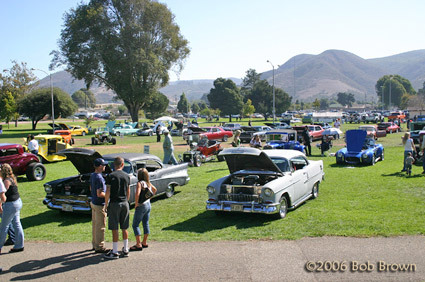 The big picture shows mostly local cars. Joshua appears to have many friends who brought out their cars for a little show and shine. 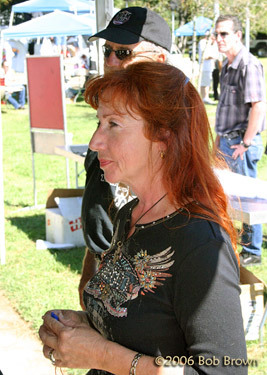 Spectators could vote for their favorite car and a silent auction was also held to help with the fund raising. A first class chicken Bar-B-Que, park style, was held starting around noon and the portions were hefty. Mmmm! 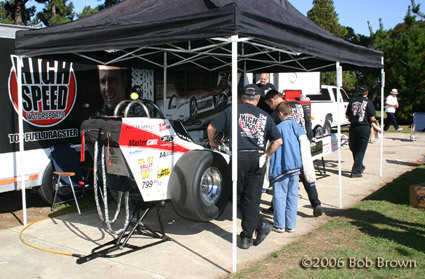 Toward the back of the park was the High Speed Motorsports car and support trailer just the way it appears at the races. The only difference here is that there were lots of trees and grass to make for a nice setting instead of the usual asphalt. It was a relaxed atmosphere for the crew, having time to enjoy things as they worked. Around 11AM, the car was to be fired for the first time. Bellemeur gets in. 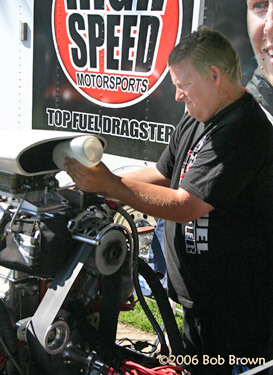 Brett squirts the methanol into the injector while Rian Konno prepares to disengage the blower start motor. 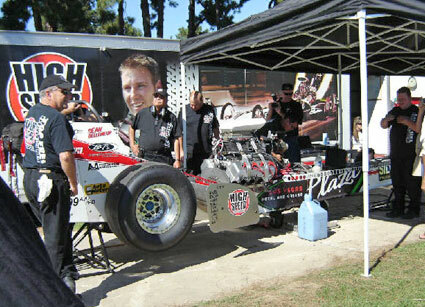 As the crowd gathers and the engine comes up to temp, the crew watches and listens to make sure all is functioning OK.
With the valve turned to change from alky to nitro, the exhaust is now quite visible. Brett whacks it and the unsuspecting crowd are startled by the violent spike in the noise level. 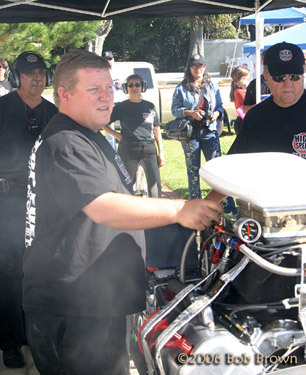 With slicks spinning rapidly, Sean prepares to pull the brake handle while Brett gets ready to shut the engine down. "Between round" maintenance included pulling the valve covers and some adjusting. Here, Roger McMartin gives the rockers a squirt of Sure Shot. While Roger works the right side, Rian Konno goes through the important steps of checking and adjusting the valve clearance under each rocker. 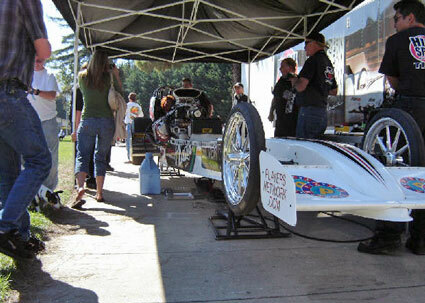 I love the adjustment tool that you see used so commonly in the pits at the races. Once the locking nut on the rocker is loosened and the proper gap set with the feeler gauge, a second specialized tool restrains the adjustment screw from turning while the locknut surrounding it is re-tightened. Ingenious. 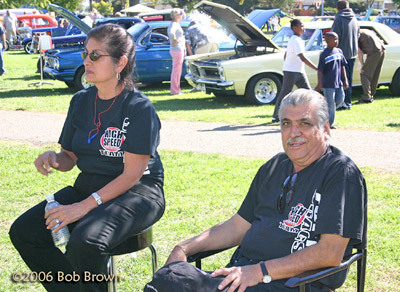 High Speed Motorsports CEO Dale Singh and his wife, Amelia are ardent supporters of the team. 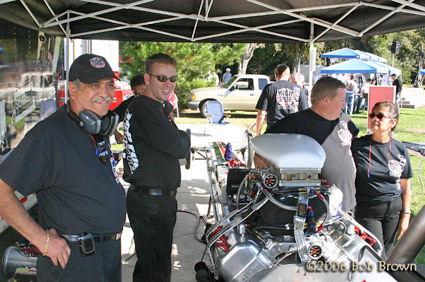 It is fun to see the joy on their faces when the crew is doing a fireup. 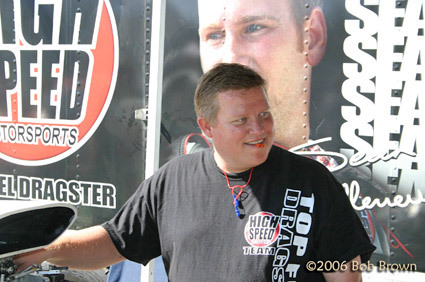 Dale is an integral part of the crew, always ready to do what needs to be done for the team's "big picture". Amelia shares her husband's enthusiasm and is always present when the team is on the road. 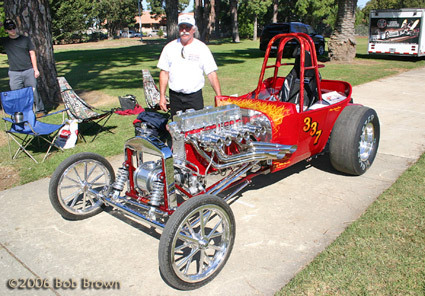 One of the other featured cars at the show belongs to Ron Anzalone of Los Osos, CA. Ron brought his beautiful "Teapot" '23 T to the fund raiser. As you can see, it runs an in line 6 cyl. 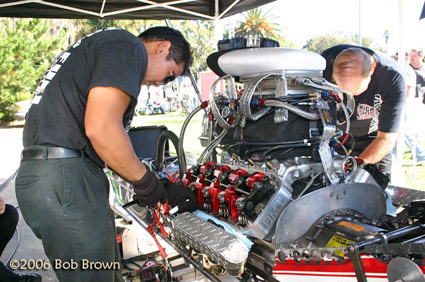 Chevy 292 engine bored to 306 with Sissell injection. The car is a regular NE3 competitor at Goodguys and NHRA Nostalgia events. It moves right on down the track pretty quickly, posting a best of 9.34 and 142 mph. And, it looks superb in doing so! The sound from the 6 is quite unlike the familiar B-8 we're all accustomed to hearing. You KNOW when he's on the track. I had quite a long talk with Ron. He described building the parts for the throttle linkage on his lathe a couple of rainy winters ago. He chose not to fire the car at this show, as it requires quite a lot of cleanup to get the shine back on the chrome, and he was signed up to do another show the following day. In his youth, he was a neighbor of the Mazmanians, and pretty much grew up at the drags with Big John & Co. 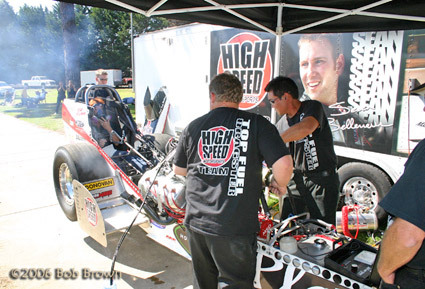 It was planned that Josh Heilbron would be taking the seat in the HSM car for their mid-day fire up. But, as the time neared, it was felt that with his precarious health condition, it might be a danger to him to be in the car (nitro fumes, etc.). So, the seat was offered to his dad, Chuck Lee. 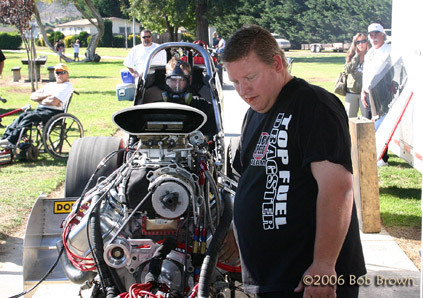 Chuck promptly suggested that since his wife (Josh's step mom) Mona had been quite excited all morning about the dragster being there, that it would be fitting if she were to take the seat instead. Here you see her receiving instructions about what to expect with the fire up of the beast. Dale Singh helps her up onto the tire for her entrance into the cockpit. The requisite "I was here!" photo. 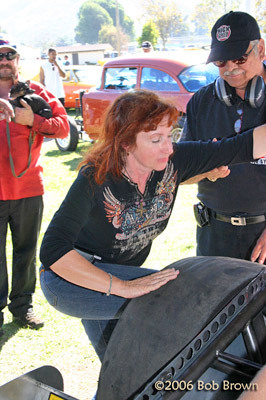 Sean settles her in, installs the butterfly steering wheel and explains the procedure. 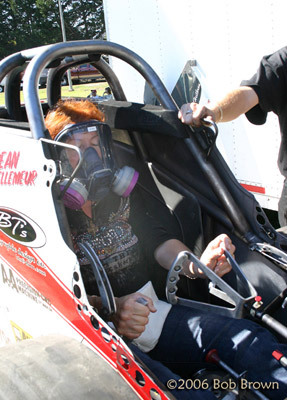 As she puts the earplugs in, Rian Konno engages the blower starter onto its mounting frame to prepare for the start. Sean helps adjust the mask. 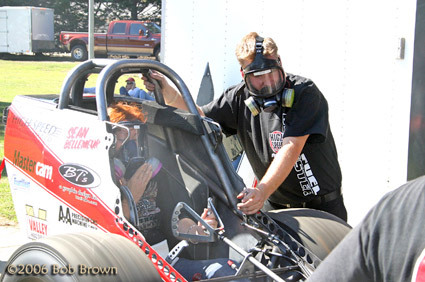 Once again, Sean gets her masked up while crewman Roger McMartin announces to the audience what to expect. He explains the difference between the alky portion for the first minute or so and then nitro portion of the fire up. Rian hits the starter and WHAM, its running! Brett watches the crowd reaction when he whacks the throttle. Looks like Mona's got a fume leak! Game over! 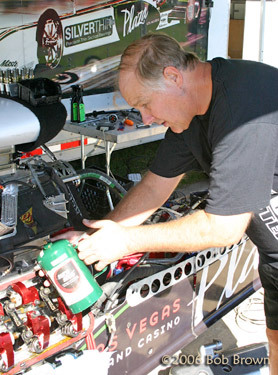 Brett squirts the juice in the injector to begin the shutdown procedure. After shutdown, Sean went over to talk with Josh Heilbron, our Man of the Day. I don't know the story behind the HSM hat, but it looks like an old favorite with signs of heavy use. Mona is beside herself after she gets her feet on the ground. Brett has that look of - "nothing can compare to it, can it?" 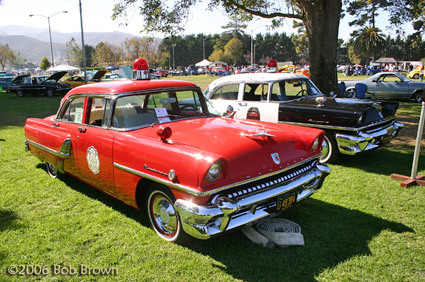 A few other items of interest at the show were this pair of Mercs with Santa Paula Fire & Police emblems on the doors. Probably enough protection for the whole town back in the 50's. 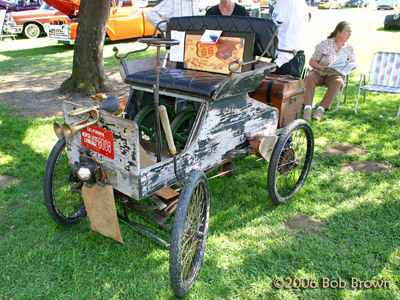 This car easily took the most "elderly" award of the show- its placard stated 1890's for the date. It had a one-lunger engine, and putt putted around the field at a jogging speed. I had to leave before the raffle drawing was made to see who would get to sit in the HSM car for its 3rd and final fire up at 3PM. I'm told that Josh Heilbron's 6 year old daughter pulled the ticket from the hat and some lucky person got it. The important part, however, is that when the day's receipts were totaled up, the result was $11,706.81 to go to Josh and his daughter. 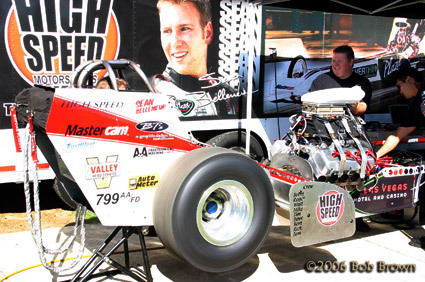 As an outside observer, I'd say the High Speed Motorsports Team - Dale and Amelia Singh, the entire crew and driver Sean Bellemeur showed themselves as great Ambassadors for the sport of Drag Racing in this undertaking. Thanks! 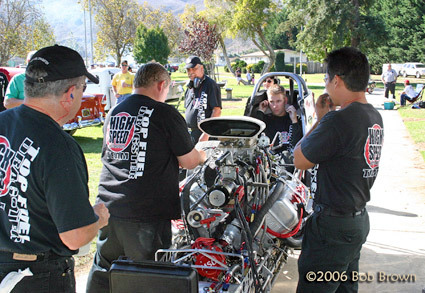 One of the day's highlights came when the winner of the Hot Seat Raffle got to sit behind the wheel and then fire up the HSMS dragster  something just about unheard of in a small, local car show. But it wasn't unheard for long. 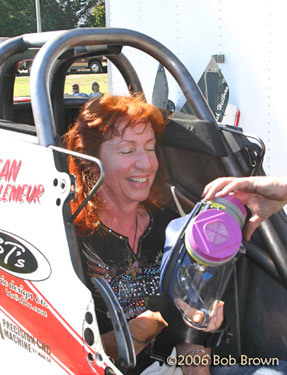 After the smiling winner suited up in protective gear, the engine lit up. 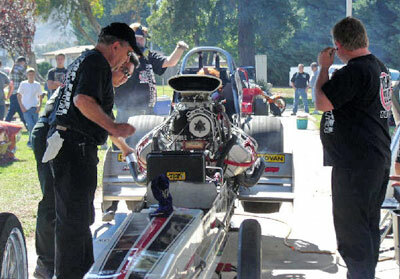 As the decibel level rose, ears were plugged and eyes started streaming as the nitro fumes drifted over the crowd. But not one person backed away. The envious spectators cheered and clapped when he climbed out.